Infantino designed The Flash’s new uniform and “speed” blur, helping revive superheroes and kicking off the Silver Age of comic books. While his name might not be on the tip of every comic book reader’s tongue, the work of Carmine Infantino is both recognizable and vast. As a penciller, inker, creator and editor, he was a driving force in the Silver Age of Comics (mid-50s to early-70s), and is consider a true legend. Born in Brooklyn, NY on May 24, 1925, Infantino’s first work was inking “Jack Frost” for Timely Comics (which later became Marvel). He was just fifteen and wanted to quit school to become a staffer at the comic book publisher, but his father refused. During the ’40s, the young artist worked for several publishers, including DC – his first work there being a Johnny Thunder story that introduced the Black Canary character in Flash Comics. 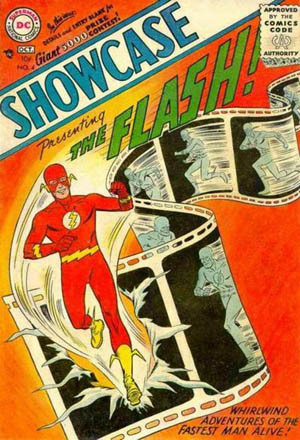 In 1956, in an effort to revive superheroes, DC editor Julius Schwartz assigned Infantino and writer Robert Kanigher with the task at updating the Flash character. Infantino designed the classic red uniform with yellow details, as well as a the red and yellow blur that was used to depict the character’s speed. The newly-designed hero first appeared in Showcase #4 (October 1956), kicking off the Silver Age. During the mid-60s, Infantino designed covers for DC’s entire line. Stan Lee actually offered him $22,000 to move to Marvel – an offer DC could not match – but the artist stayed with DC to be promoted to art director. Later promoted to editorial director, Infantino was responsible for kickstarting many successful careers, including those of artist Neal Adams (Superman, Batman, Green Arrow) and writer Denny O’Neal (Wonder Woman, Batman, Green Lantern). In 1970 he got artist Jack Kirby to leave Marvel and join DC . It was Infantino who worked with Marvel on the crossover comic Superman vs. the Amazing Spider-Man. In 1976, he returned to being a freelance artist, making him able to work on a plethora of characters and titles for various publishers. Over the span of more than fifty years, he worked on more than 60 titles and received more than a dozen awards for story-telling and illustrating. Infantino died April 4, 2013, leaving behind a legacy that will continue to have an impact on superheroes for years to come.